Us people we live in three dimensions, without thinking wheter there are other dimensions. We think it’s very normal to move left, right, up, down, for- and backwards. But how about other dimensions? And are there other dimensions, or are our three dimensions the only ones? If there are other dimensions, where are they? A lot of questions you can ask yourself, but never a content answer. When I was a child, I said that the 4th dimension was invisibility. How I did know that, I don’t know, and there is nothing to prove wheter my idea is correct or not. After all these years, I didn’t forgot the idea of an invisible 4th dimension, and the more I thought, the more I felt I was right with that idea. Most opinions suppose that the 4th dimension is time. That’s also true, because if you enter in to the 4th dimension, time will exist no longer. There will be no longer be past, present or future, it’s always NOW. Here in the 3rd dimension time exists, and so we have a past, present and future. But how about the invisibility of the 4th dimension? According to my idea the 4th dimension is all around us. We can’t see it with our material eyes. The various dimensions are standing square on each other. (see pictures). That’s the way it can happen to some people that they see out the corner of their eyes a silhouette made out of ‘air or water ‘. These disappear if you look directly at them. If you look straight ahead, then these ‘water or air silhouettes’ can be appear in the corner of your eyes. The corner where they appear is about 90 degrees. The difficulty is not to look in the direction where they are. Try not to look that way, and see what happens. 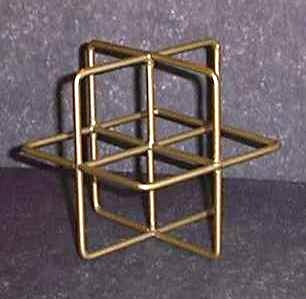 If the various dimensions are standing square on each other, where are the other ones? Are they all standing square on each other? The fourth one has to standing square on the previous ones. But where is the 4th dimension? After some thinking, I made the next picture. The point in the middle is the place where we are. From there out we can go in any direction we want. Left, up, behind, name it and we can go there. Only not to the 4th dimension. At least we think we can’t. According to my picture you can say that the 4th dimension is all around us, only we can’t see it with our earthly eyes. Those who can see the 4th dimensions are psychic, who can see ghosts of deceased who are in the first three upper tones of the 4th dimension. Every dimension has 12 upper tones. If we dream at night, or we are daydreaming, we are in the 4th dimension. By meditation or drugs we can visit this invisible world. A world where we can travel by mind. We are all going to the 4th dimension, but if that is going to happen when we are dead, or maybe by a dimensional change in the near future. I don’t know, but as ever, time will tell. Copyright © Robert Boerman 1999.